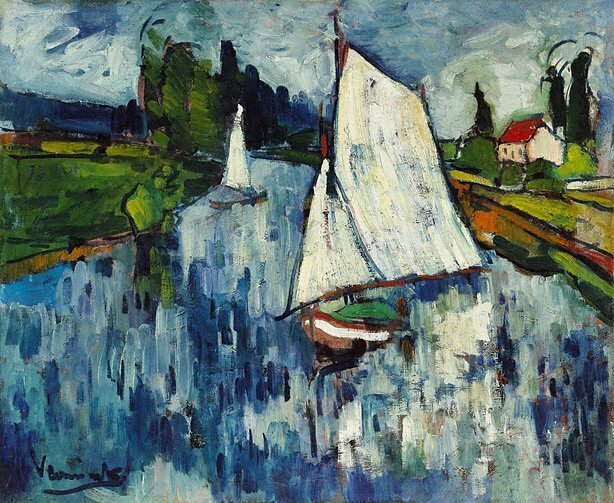 'Sailing boats at Chatou' represents both Fauvism and Maurice de Vlaminck at the very peak of their achievement. To appreciate the very real vivacity and originality of the Fauve movement for those few brief years one only has to compare this fresh, breezy, bright and colourful work with the Gallery's later Vlaminck of the post-Fauve period, 'The red roofs (Landscape)' 1912. There is a world of difference between the two; the convincing credibility of the original initiative shines like a beacon in comparison with the later work. One of the more intriguing snippets of information about Vlaminck is that he very nearly became a professional racing cyclist instead of a painter but that opportunity was thwarted in 1896 through his contracting typhoid fever. However he did continue with the violin. The story goes that he met his great Fauve colleague, André Derain, when both were on a tram that happened to derail. 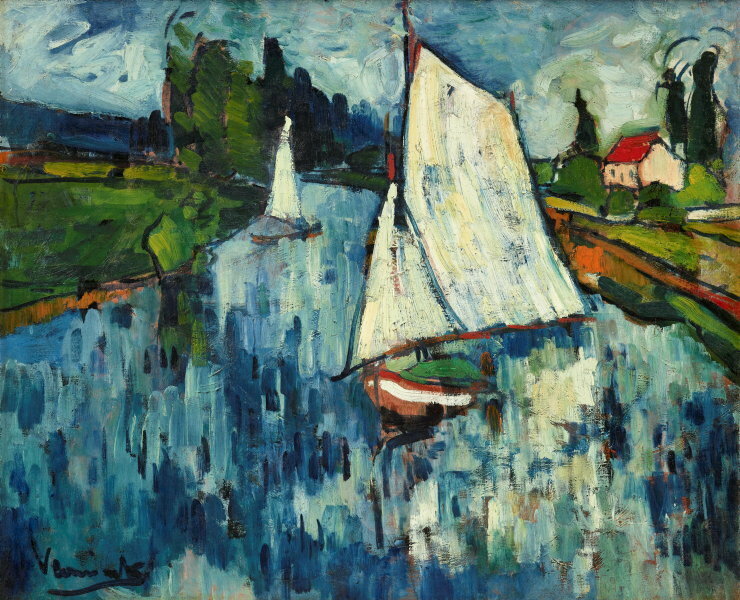 Whatever the true circumstances Vlaminck and Derain decided to share a studio on the Ile de Chatou, which happened, probably, around 1904 after Derain had returned from military service; a trial from which Vlaminck himself had returned in 1901. Henri Matisse was another confidant of Vlaminck and Derain and the three became the undisputed leaders of the Fauve movement. Others associated with the group include Georges Braque, Kees van Dongen, Raoul Dufy, Othon Friesz and Albert Marquet. 'Sailing boats at Chatou' was painted at the very zenith of Fauve activity and is therefore a perfect representation of the movement. It may not be as bright and varied in colour as some works, but the elemental tones are dramatic and contrasting. There are the characteristic brightly charged moments such as the sudden red roof of the riverside cottage, the formidable white sail of the boat that confronts as we approach the picture and that strange splash of orange in the river bank. Look closely at this painting and you will discover just about every colour of the spectrum, sometimes subdued, sometimes overt. Then there is too the energetic and lively brushwork; those vertical stabs brimming with energy which give the water paradoxically a shimmering but reflective surface; the flourish of brusque strokes which bring air and breeze to the clouds and the windswept trees. All are qualities of exuberance that are the very essence of the Fauve genre. Equally fascinating is the existence of another, similar but not identical painting by Vlaminck clearly depicting the same stretch of the Seine but with the red-roofed house on the other bank of the river, which must have been painted at the same time although it is undated. This work is in the collection of the Hermitage Museum in St. Petersburg. Signed l.l., oil "Vlaminck". Not dated.